Set the visibility and permissions of features by going to the Menu on the right side of the board, then clicking 'More' then 'Settings'. Permissions and options will vary per user. 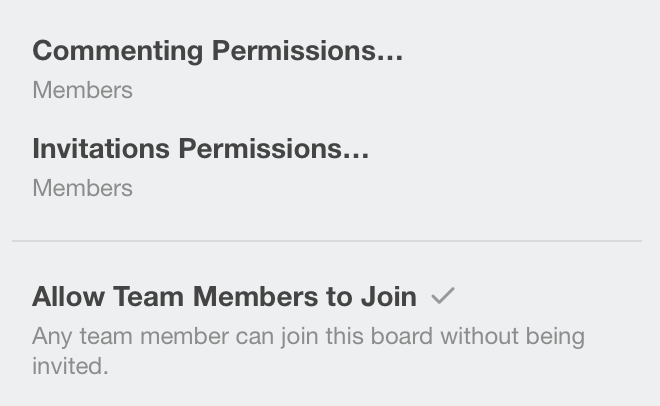 Board admins have a different set of permissions on a board. Only a board admin can remove users and change the commenting permissions, for instance. Invited Members - An invited user is someone who has been invited to a board but who hasn't yet confirmed their account. Their user icon will appear to be grayed out in the Members area of the board. Board Members - A normal member is simply a member of a board. Observers - An observer is a member with read-only access to a board. (Observers are only available to teams with Trello Business Class). Team Members - You can make a board belong to a team, so a team member is a user who belongs to the same team as the board. Guest - A normal member on the board. The user is however not a member of the team that the boards belongs to. Board Admin - A board admin is a member of the board who can do anything on the board. Board admins are marked by the blue and white chevron in the bottom right corner of their avatar. Disabled - no one is allowed to comment. Members - Allow admins and normal members to comment. This is the default setting. Members and Observers - Allow admins, normal members, and observers to comment. Team members - Allow admins, normal members, observers, and team members to comment. 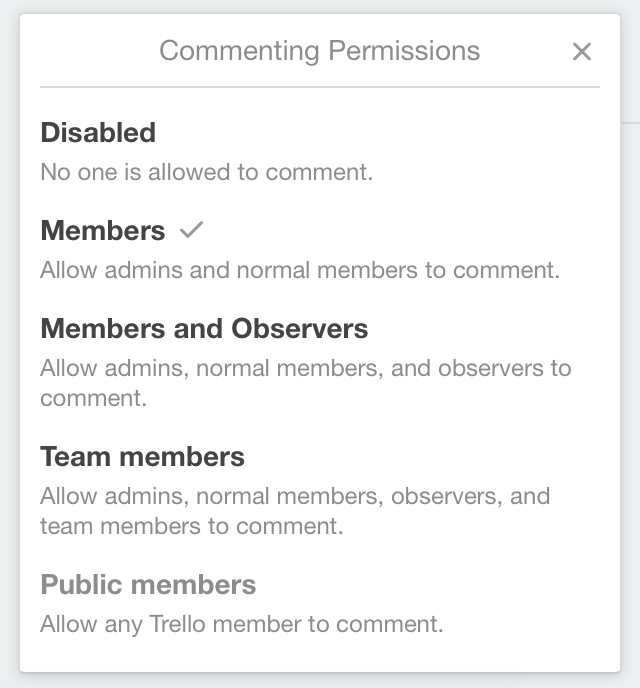 Public members - Allow any Trello member to comment. This option is only available for public boards. Admins - Allow only board admins to add and invite others. 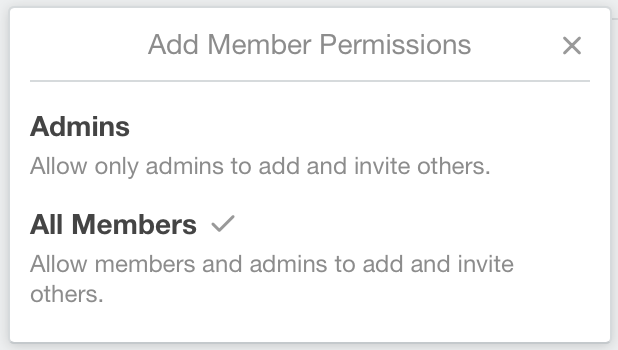 All Members - Allow members and board admins to add and invite others. This is the default setting. 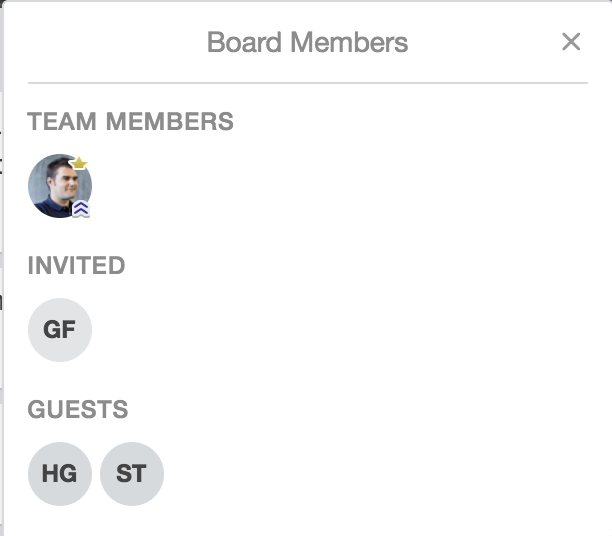 NOTE: If a board belongs to a team, you can enable the setting " Allow Team Members to Join," which will allow any team member to join the board without being invited. To enable this, the board must belong to a team and the board cannot be private.